Can u fit the CO2 cylinder in there as well or did u drill a hole for that line as well ? Beautiful setup. Looks like new. How many liters is it? Where do you do your fermentation? Thanks. If I remember correctly, its a little over 400L. It's actually used, but in very good condition. Got it off an auction in ebay. I've a separate half-sized wine fridge to do my fermentations. Keat.. have nothing to say except.. GOOD ONE !! E-bay thats where I picked my one but then directed to shop,, but as good a deal as ever..
My similar. We are all getting there. Can fit 3 kegs a & 20lb bomb in mine. 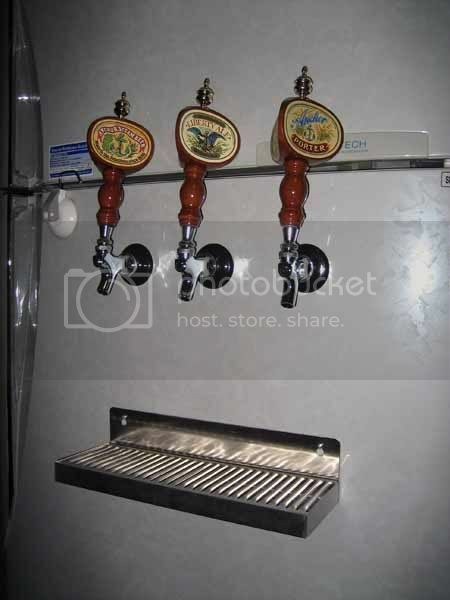 Have to figure out the best way to serve Bosses stuff as well now as that's under Keg as well.. Wont be allowed another Fridge so may have to fit one below others. Like U dont have any fluids to serve as yet, Porter disappeared before I turned around.. Nice drop,, going to put a stout down this week,, Have 2 lagers in CC at moment.. still have some DME to use so still plugging away at it ..
Hey Uncle Spud, where u been man ? Spent most of week end trooping visitors around to all the beer drinking spots, each one drove another nail in my coffin,, dead each night at 7.. into bed with hot johnny the walking man bevo and up and at it again next day.. Didnt get a chance to buy any more AGB gear. Drunks have gone to wetter pastures, they sampled my 1 day into CC latest Brew & had to lock it away, not that it was excellent ,, just that it was there !!! So Mate been dead and reborn this week end, last fingers of Flu still hanging on but better by 100%.. Had mobile snatched last night at Condo was found by cleaners this morning.. so back to normal just about.. Hope to Brew this week.. still have some keg space to fill so will be at it as best I can..
Keats fridge does look great doesnt it..
spud wrote: Keat.. have nothing to say except.. GOOD ONE !! Advice from me is simple. If U are determined to drill through the sides go ahead but first work out where U are going to put everything,, dont forghet U get more brownie points for having a clean looking beer Fridge from Domestic control, so inside is better.. But once U have figured where you are going to instal. mark the inside only and carefully cut the plastic inner skin in a sqare bigger than the intended hole and carefully remove the insulation and when U are satisfied where U intent to have the hole is clear ( these return lines are 1/4 - 3/16 in dia so are small) Drill a pilot hole from the inside the open out to hose size, add a gommot if U can to stop the edges cutting hose. Drill hole in some plastic ( I used a flat portion of the redundant shelves) bang some insolation in the gap and RTV the attachment wall in place,, perfect holes even around tubes but U would have found them by the eyes not by the DRILL..
Spud, where did you get the hole-saw and the grommet to fit the hose? Do you mind loaning me the hole-saw if you still have it? What happens if you find a gas line in the path? What do you patch it up with? Found the tube and nicked the sucker,,, deathly silence was heard by two not quite sober wankers,, ssssSSSSSS the it stopped .. No more SS meant no more Gas.. Old style fridge ment gas was going to be $550 and the repair was about $200.. No thanks gents out with that one in with the new .. bigger so no whole in the side,,, but if I had to I'd do it again the way I discribed above, below or where ever it is.. Drill size I have for the Tap shanks is too big so i just pilot then bigger and bigger till I reached the inner size of the Grommet and that was it..
Have a sellection of drills that u are welcome to but Grommets ,, well i had one that I was going to fit to Old Fridge but he's gone as well as most of the evidence before Boss came home last time. Just got in this big sucker. 434L for $150. Should be able to fit 4 kegs and a 20lbs Co2 tank.